Yesterday I managed to finish and block my father’s christmas gift. Today I managed to finish and block my mother’s christmas gift. They are both fantastic, and quite frankly my dad’s gift may get a part two. They are actually going to be quite difficult to give away I love them so much. But, I can’t show you until after christmas. Instead, I figured I’d ball up some yarn for a project of my own. I got a new winter coat this year, and I realized that I have yet to knit any accompanying accessories for it. I also realized I have yet to knit anything from loop bumps I’ve spun. So, I looked in my stash, found a lovely two ply, and wound it into cakes. Let’s talk about winding yarn for a second here. Recently most of my winding is done by hand, with a nostepinne I picked up at the Taos Wool Festival. It is from KCL Woods. But even before the nostepinne purchase, I’d been winding by hand for quite some time. I think this has something to do with working predominately in handspun, and loving the handspun so much that even winding it is a pleasure. However, I have close to 900 yards of this loop handspun. So, I figured it would be a little overwhelming to wind it by hand when I was eager to start immediately. 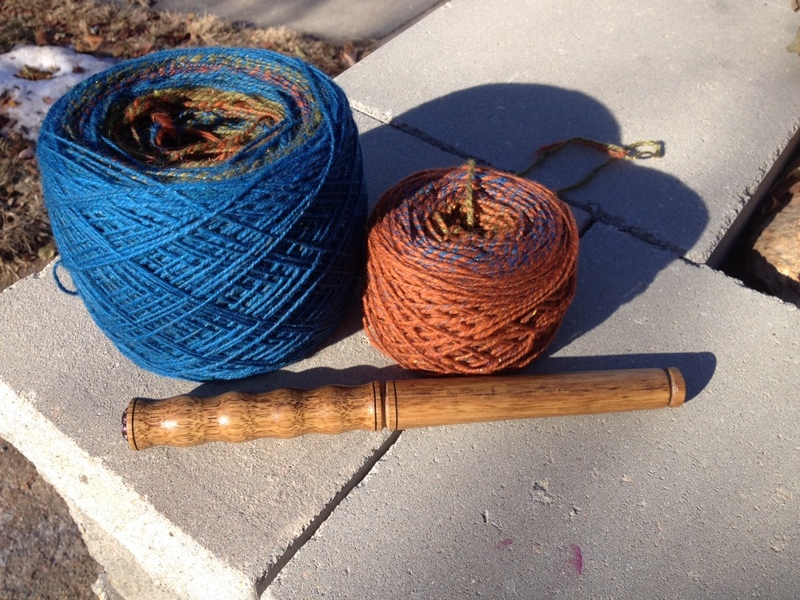 I wound the first smaller ball with a regular royal ball winder, but for the second skein, which was HUGE, I pulled out my strauch ball winder. This one comes in handy when I need something for a particularly large skein. I can winder faster with the cheap royal, but it was worth it to pull out the Strauch. So I figured I’d grab a photograph to show the difference. Added bonus, I grabbed the nostepinne and threw that in the shot as well. I could not finish the knitting project with the Jacob Fleece yarn I plied earlier this week, so I was forced to spin some more. I totally forgot what a pain this particular fleece is to spin, and how it is quite dirty (my fault for giving up on a fleece that was less than amazing) and how it makes my entire house dirty when I spin it. I forgot how I only spin this in the warm months, out on the porch, to save myself from that. It took two days, but I do have another skein of light gray yarn. This time I have 108 yards. I also decided to work on a new spinning project. 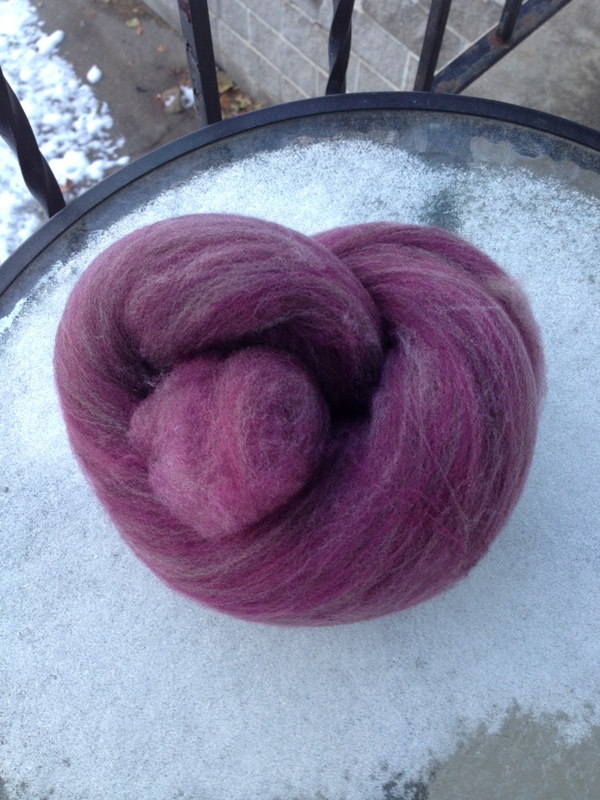 I’ve had this superwash merino from Enchanted Knoll Farms in my stash for years. I think I purchased it online, and when I got it, because all that was showing were the more muted colors, I put it away. Well, once I opened it up, I realized why I purchased it in the first place. I love the blue and green against the brown, and I wouldn’t really call it all that muted at all. Now with two spinning projects on the spindles, I should have plenty to keep me occupied when I am absolutely sick of Christmas gift knitting. While I took this week off to get crafting done, or more specifically, get some fleece washing done, that hasn’t happened at all. Instead, I’ve been doing deep cleaning around the house. Seeing as that feels wonderful and productive, I am not too upset. And I have plenty of fleece to process before I truly need to wash fleece again. No big loss. One of my big jobs was the “toss the stash” job. 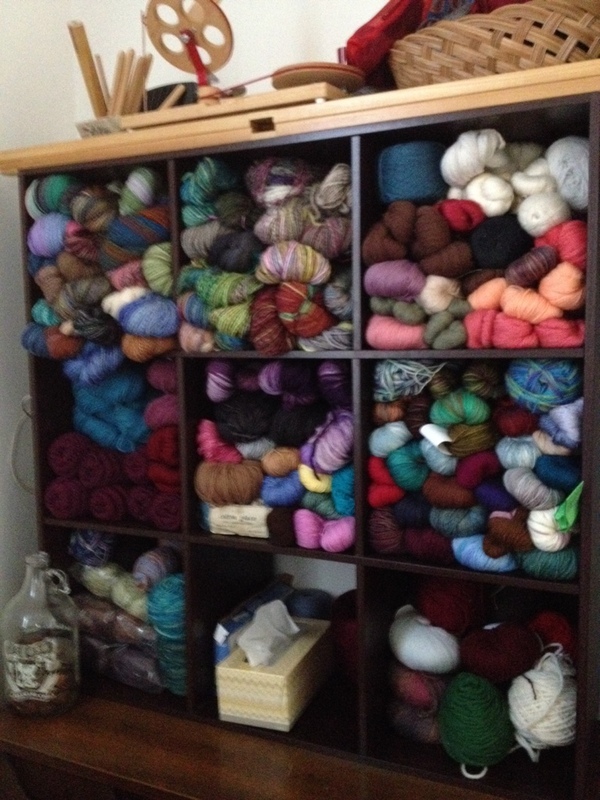 I needed to reorganize my yarn cubes and I needed to do some dusting as well. I’ve been selling off yarn regularly, due to just not using commercial yarn very often and due to financial circumstances. I also have a lot more handspun than I used to, and it was all over the place. So, I reorganized, handspun in two cubes and the rest separated by weight. It looks much better now, and it is completely inspiring to study the cubes and consider what I can do with the yarn. I also organized my knitting/crafting book cabinet and entered all the books and magazines in my ravelry library. This is very convenient when pattern searching, and I am excited to have it done. Happy Thanksgiving everyone! Have a wonderful day. Due to circumstances beyond my control, this Christmas will be a frugal one. So, much knitting is happening in this household. This is great for me, it has renewed my knitting interest a bit, and I am enjoying my progress. However, it is bad for the blog as my intention is to take pictures and then save them for after Christmas. But, I did do some spinning. I have been working on that jacob fleece for a good long time now, I have spun through the darker colors and had 3 balls of gray in varying shades to ply. I finally got around to that yesterday. I am consistently amazed at the yarn this fleece makes. I basically start with some very very rustic looking singles, spin them long draw, ply, give it a very good thwack, and end up with this really bouncy yarn. Is it rustic? Heck yeah, but it also looks amazing. 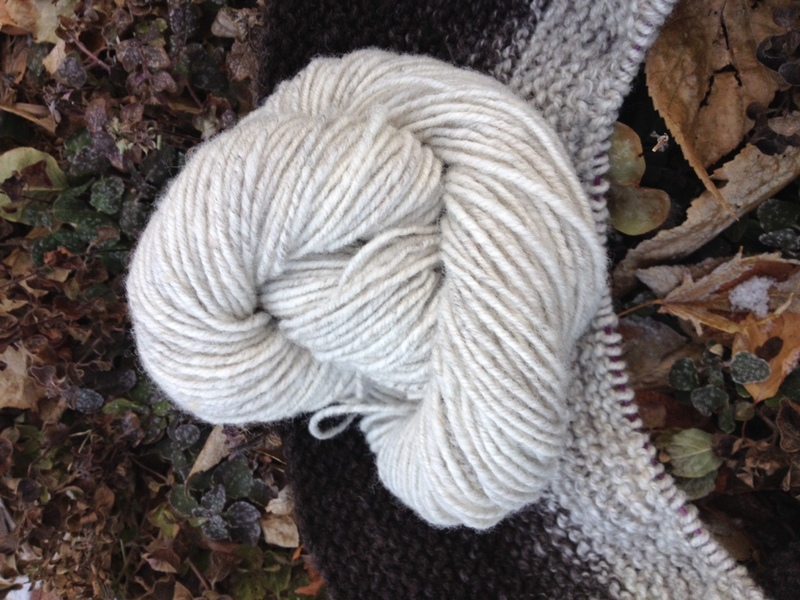 This spin yielded 82 yards of worsted weight 3 ply. It really is wonderful tonal stuff and I can’t wait to use it, but since it is for a christmas gift, I won’t even be able to show you for a month! I am afraid I’ve put myself in a bit of a bind with this gift though, I keep running out of yarn and needing to spin more. Not quite how I intended it to be, but I suspect the end result will be worth it indeed. Day #1 of vacation was yesterday. And I spent the entire day cleaning. I got started in the morning and was just too inspired to quit. I did the kind of cleaning we all need to do sometimes, but is completely uninspiring. The kind where we take the pillows off the couch and vacuum the couch, the kind where you dust and wash all the baseboards. That kind of cleaning. It felt really really good to get done, and I think it will make me feel much more relaxed during the week. That being said, I didn’t have any time for crafting at all. 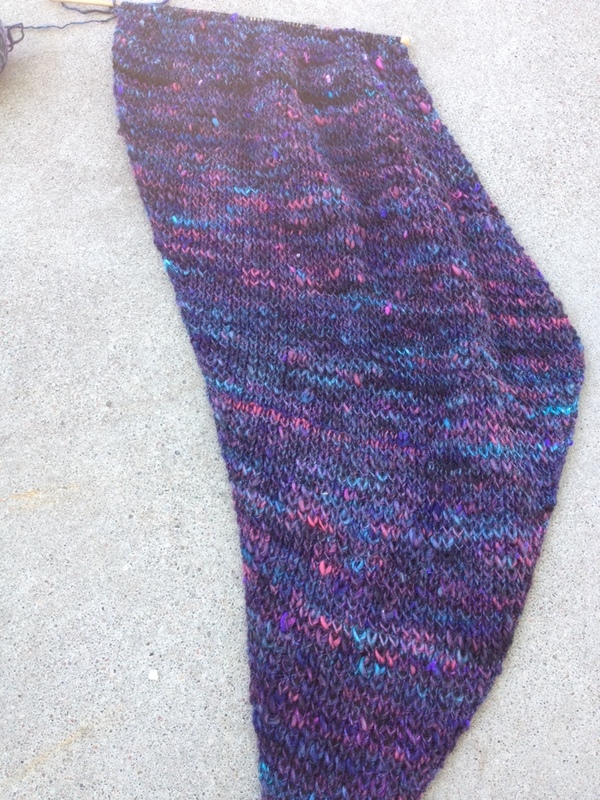 So, I decided I’d take a picture of a project that has been on the needles for a bit now. I love it. It is a bias knit cowl I am knitting in the handspun singles I recently blended and spun. The pattern calls for using two different size needles, and this makes for a waffle like soft squishy fabric that I am completely in love with. 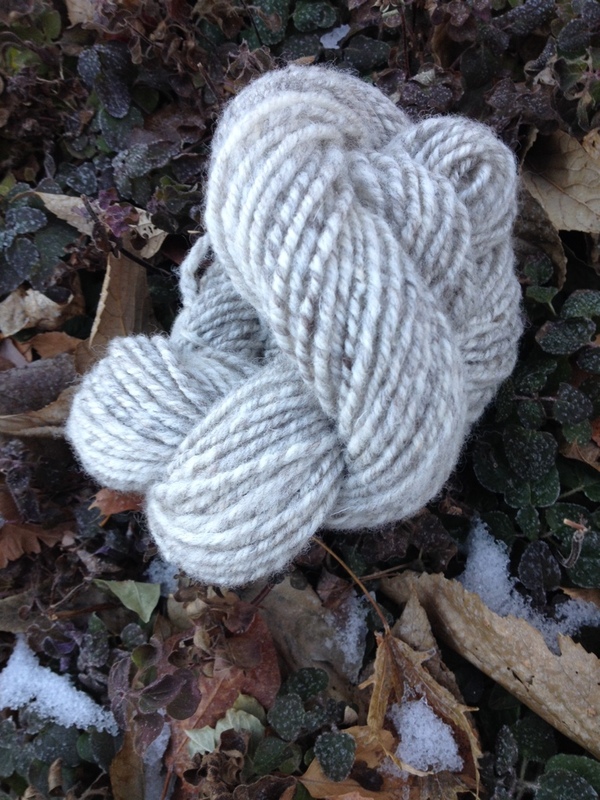 And it lends itself very well to the thick/thin nature of handspun. I am having trouble working on other stuff simply because this one is so addicting. Here’s another one I’ve taken quite a bit of time to finish. I started this well before I left on my New Mexico trip. I decided that I could spin this on my spindles, and once I got started, I realized it was spinning quite thin very naturally. So, I went with it, even though that means a long project and I was already in the middle of another thin and long project. 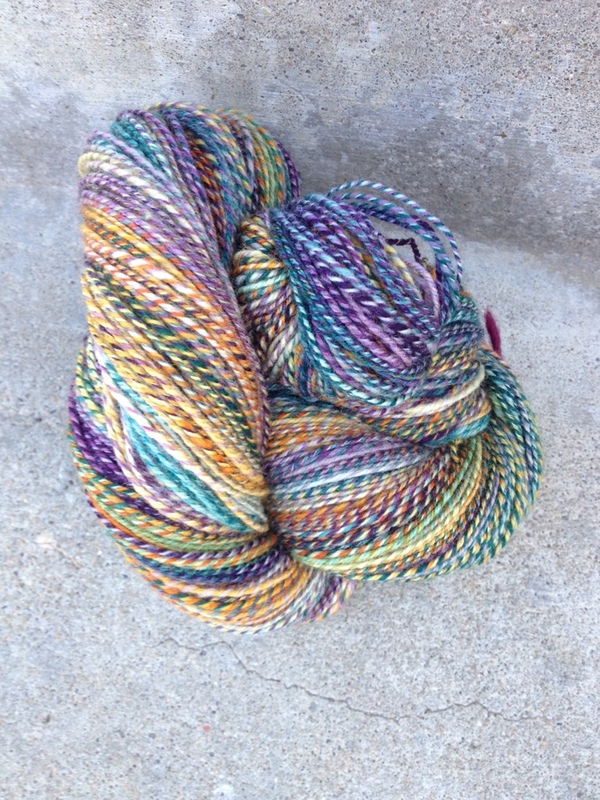 This is dyeabolical’s colorway flowershop inferno. I did this one in a 3 ply fingeringweight. This is superwash merino, but I have this colorway in another fiber as well, so I am considering spinning that and chain plying just to compare the two. But, that will have to wait for a few other fantastic projects I have hanging around. I have a total of 500 yards on this one. The colors are all crazy and so I have no idea what kind of project this should be. Maybe something in linen stitch! I am fortunate enough to be on vacation this week. Just staying home and doing all the things that need to get done around the house. I am quite excited about it. I decided that the first thing I should do is clean, since that will allow me to enjoy my vacation more. And then put away the drum carder. I love this batt, and should have 4 oz. or so by the time I am done. 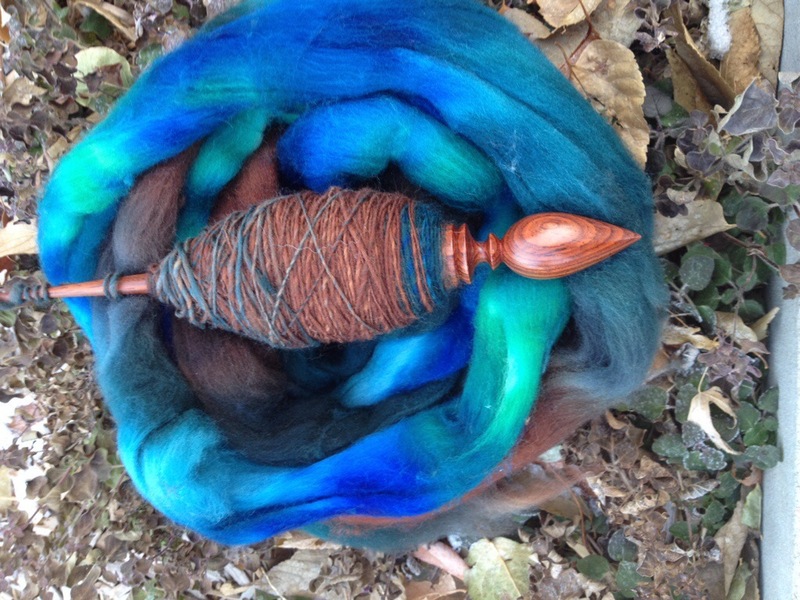 Again, this is dyed locks paired with undyed locks from a CVM Romeldale fleece I have in my stash. I think it is quite fabulous!